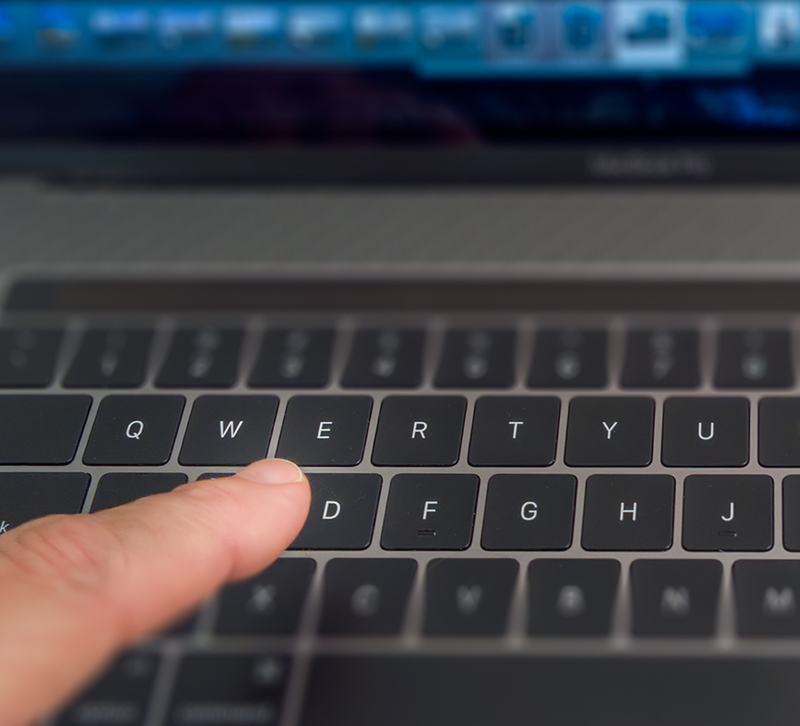 You should be using the Keyboard Shortcuts for Lightroom Classic. The more you use Keyboard Shortcuts for Lightroom Classic, the less time you’ll spend hunting for menus and buttons. And that means less stress, more productivity and definitely more Lightroom happiness. For example, when you want to develop an image, tap D for Develop. To return to the Library from the Develop module, just press G for the Library grid view. Don’t tap L for the Library, which is a common mistake, as that will put you in “lightbox” view which darkens and hides the Lightroom interface. A little disorienting if you didn’t expect that to happen. If it does, keep tapping L to return to your standard view. Wanna make a print? Command (Control on the PC) P takes you right to the Print module. You probably know that the Tab key hides the side panels, but did you know that pressing Shift and Tab hides the side panels and the filmstrip at the bottom. More screen space if you’re working on a laptop! Just tapping on the + and – keys (Mac and PC) will increase or decrease the size of your Library Grid thumbnails. And here’s something that will change the way you look at thumbnails – tap the J key while you’re in the Library and show the metadata associated with each photo. You can choose what data you is displayed by going to the top menu and choosing View>View Options to change the settings. These Keyboard Shortcuts for Lightroom Classic speed your workflow, but more importantly, you’ll find working in Lightroom more of a pleasure, not having to move your cursor here and there, pulling down menus and reaching for buttons. And although the shortcuts are incredibly useful, some of the keystrokes used in the Library, will produce different results if used in the Develop module. 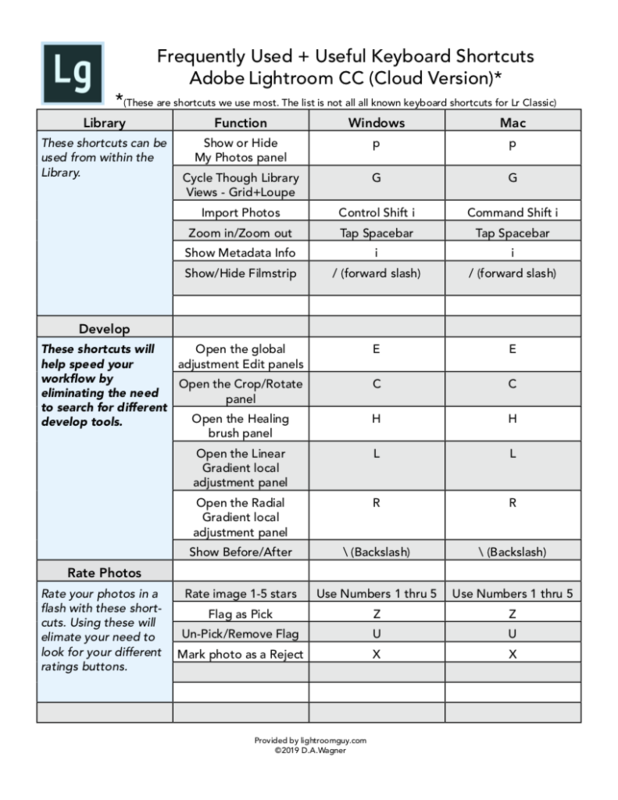 Sign up for Lightroom Guy’s Newsletter on the right of this article to download our cheat sheet of our PDF of frequently used Keyboard Shortcuts for Lightroom Classic. To get the full list of Keyboard Shortcuts for Lightroom Classic, you can see them on the Adobe site here, but you’ll like our cheat sheet better; it has most of the shortcuts you’ll want to use anyway. Do you ever find yourself dreading the amount of time it takes to develop all the photos from your last trip? Well, you are not alone! Over and over again we hear from clients about how they avoid selecting and developing because of the shear number of photos they took. One of our solutions is to demonstrate how we take advantage of all the features that Lightroom has to offer. And one of them is, that there are four ways to adjust Lightroom sliders in the Develop module. We know it sounds a little to simple but, knowing how to quickly adjust the sliders in the Develop module can really speed up your workflow.We’re going to show you four different ways to make slider adjustments, most of them without even having to use your mouse. You’ll be surprised by how much time these four little tips will save you! And, whether it’s sliding, dragging, entering numbers or making incremental changes, each of these methods is designed to give you total control. Try each of them the next time you develop. It may not seem like a big deal, but like all things Lightroom, these different techniques will enhance how you work when developing your photos. Hovering over the slider and tapping the up/down arrow keys is my favorite for making incremental adjustments. It gives me the most control over my adjustment settings. And, while holding down the SHIFT key while tapping the up/down arrows will make larger changes, holding down the OPTION key (ALT on the PC) will make smaller changes. It’s the most exact way to make critical adjustments when developing in Lightroom. While you might know what all the Lightroom adjustment sliders do, play our quick 90 second LR:Shorts video below and see how fast it is to learn the four different ways to adjust them. In an earlier post, I wrote about setting View Options – specific camera metadata you can view on your image thumbnails in Grid and Loupe Views (Shutter speed, F/Stop, Exposure, Date, Camera Serial #, etc.). It’s incredibly useful, especially learning what went right (or what went wrong!) with your image captures. Since my View Options blog post, this issue this has come up again, so I’m demonstrating the J, I and L keyboard shortcuts and surprises that can happen between the Library and Develop modules. I hope this makes things clearer. I love teaching keyboard shortcuts. But sometimes they come back to bite me. In this particular case, to help my students speed up their workflow, I teach them the keyboard shortcut of tapping the Y key in the Develop module for a preview of side-by-side before and after develop changes. Tap the Y again and you’re back in the Develop Loupe View. And here’s the common keyboard shortcut error in Lightroom: the T key is positioned right next to the Y key. And when T is unintentionally tapped instead of Y, you may not notice that it causes a change across all of the Lightroom modules; it hides the Toolbar! Sometimes you don’t notice it’s missing until you need it, especially if you use a lot of keyboard shortcuts or work in a hurry (like I do). This notification banner only appears for a couple of seconds, just above the bottom filmstrip. In Lightroom versions 1 through 4 there was no notification banner! There you are, having such a great time developing your photos and enjoying tapping that Y key to jog back and forth to preview your Before/After. You take your eyes off the monitor, press the T key by accident, then press the Y to cover your mistake. Oops! Banner goes up, banner disappears. You missed it because you’re still looking at the keyboard! You look up. You’re in Before/After, so all is right with the world. But you missed the warning banner and now, at some point, you find yourself wondering, dude, where’s my Toolbar? Tapping the T key hides and reveals the Toolbar in every one of Lightroom’s modules not just the Develop module. Simply tap T and the Toolbar returns. 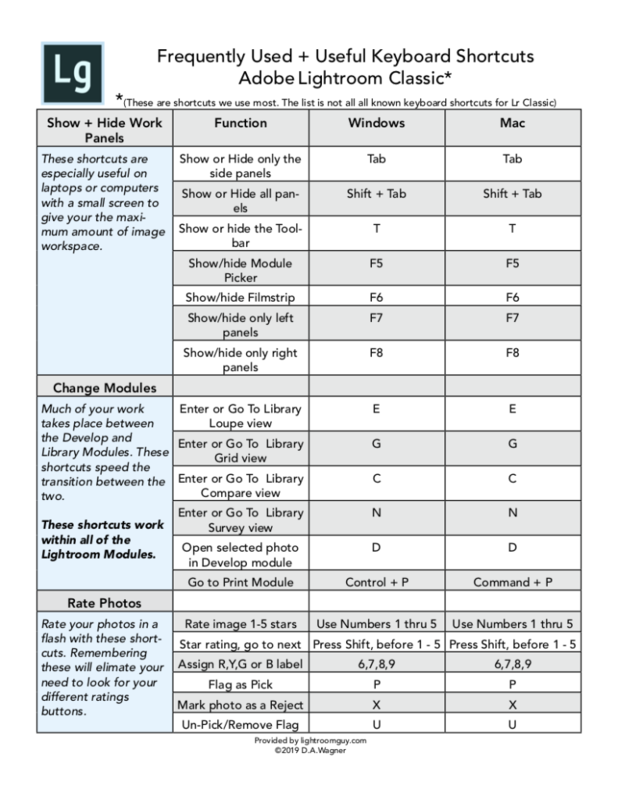 Unlike Photoshop where keyboard shortcuts are consistent throughout the application, many of Lightroom’s keyboard shortcuts do one thing in a given module and have a different function in another module. So it’s really important to look over Lightroom’s keyboard shortcuts in the manual. Here’s the link to the current Lightroom manual in its entirety – you’ll find all of Lightroom’s keyboard shortcuts in Chapter 17. I set my Lightroom View Options in the Library to show specific photo metadata (Merriam Webster definition:data that provides information about other data) when I’m editing (paring down to the best of the best) in the Grid View. For me, it’s a learning experience. I get exposure information that tells me if I did something wrong (or right!) and see my capture time (important to me!). Expanded cells show me as much info as possible, including the file extension (always raw for me, but sometimes things get changed by accident) and my file base name or copy name. To set your View Options dialog box for your Library Grid View, tap Command J (Control J on the PC) or go to the top menu to View>View Options…. and choose the Grid View tab in the dialog box. It’s very simple to set up. As you select and deselect checklist items, your Grid View (in the background) metadata will reflect those changes immediately. I am using the Show Grid Extras: Expanded Cells from the pulldown menu. After filling out the Expanded Cell Extras section, I can now view information I need on both the top and bottom of my thumb-nails that are not visible in the default Compact View. Make sure to check the “Include Color Label” box in the Show Rating Footer; I use color labels to further identify images I want to develop. This will add a small rectangle at the bottom of each thumbnail that acts as a pulldown menu to select color labels when you click on it. When you’re finished setting the Grid View Options, Simply close the window. But sometimes I want less information on my Grid View thumbnails. Tapping the J key in the Library Module will now cycle through the View Options you have set. If you haven’t set your Grid View Options, Lightroom will cycle through the default views. Each time you tap the J key, Lightroom cycles you through the three View Options to either hide the data, show compact data or show the full data you have set in expanded cells. Pressing the J key in the Develop Module turns on the highlight and shadow clipping indicators. NOTE: Tapping J only works in the Library Module Grid View! Tapping J in the Develop Module turns on the highlight and shadow clipping indicators. 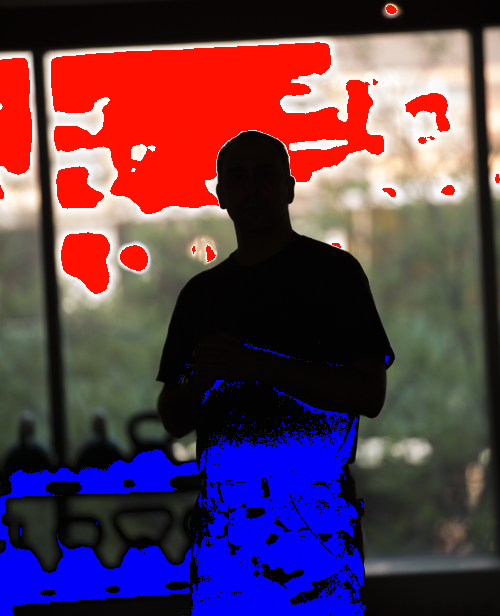 Red and blue will appear on your photo in areas that are over or under exposed. If this happens in the Develop Module, tap the J key to turn it off. For total transparency, so you know, I sometimes tap the J key by accident in the Develop module (see J key, above) because I forget I’m not in the Grid View! 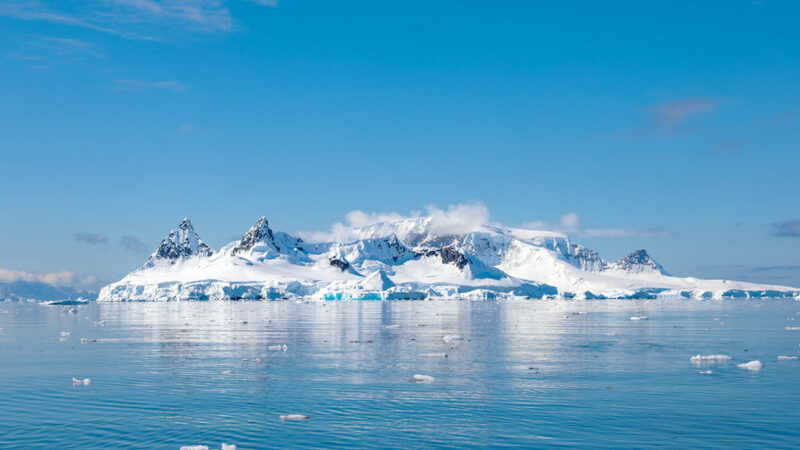 Consecutive photos can look very similar when viewed as small thumbnails – or exactly the same – so I switch to Loupe View to view an individual selected photo. I have my View Options set to show my camera metadata in Loupe View, which shows me my shutter speed and f/stop on the top left. This gives me clues as to which of my photos in a series might be sharpest or have the best bokeh. 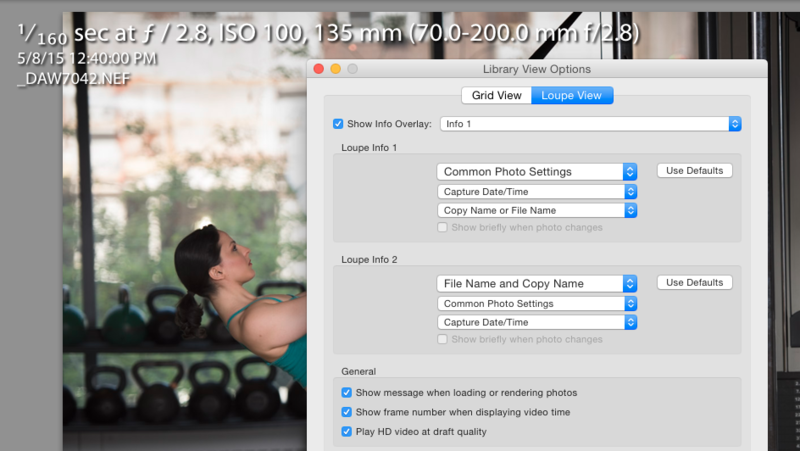 You set your Loupe View Options in the same dialog box you used to set the the Grid View Options. Tapping the keyboard shortcut i in Loupe View lets you cycle through viewing the metadata you set, and this works in both in the Library and Develop modules. (FYI: If you tap i in the Book module it shows the book size and number of pages.) And, unlike the J key, tapping i won’t get you in trouble in other modules by doing something unexpected. Now this may seem obvious since I’ve already mentioned this a few times, but Command or Control J is the keyboard shortcut to open the View Options dialog box in the Library and Develop modules. Tap Command or Control J in the Slideshow module and you’re prompted to save your slideshow as a PDF. In the Web module tapping this combination prompts you to save a web gallery. Just sayin’.